Do I have to come to the workshops to participate in the parade? No, the workshops are to help people with their creations. Are the workshops free? Yes they are. Is there a fee to be in the parade? No, we just ask that you register so we can keep track of numbers and it also helps with placement so we can spread the musical groups out. Registration forms can be found under the Registration section on the side bar. Do I have to register to be in the parade? No, however, we strongly encourage registering before the day of Procession or on the day of Procession day. See above. Is Procession of the Species just for children? No, it is for all age groups. I have a band and we would like to play in the Procession, is there anything we should know? That's great please register ahead of time so we can provide adequate space between large musical groups. There are no motorized vehicles, so instruments you can play while walking are best. 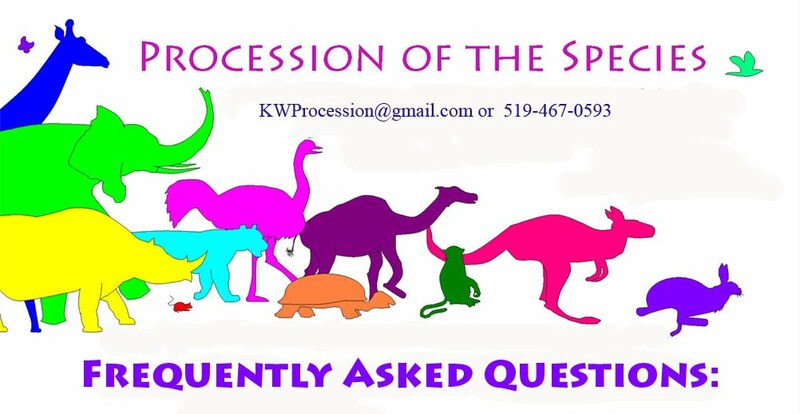 Just contact us at kwprocession@gmail.com You can help run workshops, help build costumes, help on the day of Procession, or help promote /advertise. There are many ways for people to help. Do I have to dress as an endangered species? No. It's great if you do but it's great if you dress up as anything. I was a various lifeform for halloween can I wear my costume? Of course, we are honouring all forms of nature, just keep that in mind. Please don't go out of your way to dress like a human.